This short (141 pages) and very readable book is a good introduction to some of the most useful concepts and best practices for terrorism analysis. As the title suggests, it is written primarily for practitioners, such as working professionals from law enforcement, fire services, or emergency management who find themselves serving as intelligence and homeland security analysts. The focus is on terrorism analysis, but many of the principles discussed in the book would be useful for anyone—whether practitioner or student—who is working to understand and analyze homeland and national security threats. The authors attempt to provide a structure to the terrorism analytical process, which is a very useful effort because much of the focus of reform efforts within the American intelligence community since the 9/11 attacks has been aimed at improving the work of analysis. The book is partly a work about terrorism, and partly about the business of intelligence analysis, and thus it fits somewhere between the vast terrorism studies literature and the smaller set of works on intelligence analysis. Other more comprehensive books are available on intelligence analysis in general,1 and on homeland security intelligence in particular,2 but this book offers a different approach, primarily because it emphasizes the use of Social Identity Theory (SIT) as an overall framework for terrorism analysis. The first chapter is an overview of some of most important challenges facing all intelligence and terrorism analysts, such as the cognitive biases from which we all suffer. The authors explain that a primary goal of the book is to help the reader apply structured thinking to overcome these biases; as an example, they encourage analysts to seek out primary source material on potential problems or threats, rather than relying on second hand accounts. This may be obvious to most intelligence professionals (or to most graduate students), but it is worth emphasizing, especially in a book aimed at those without extensive experience or training in analysis. The authors of this book appear to be on shakier ground, however, in arguing that many academic students of terrorism have persisted in believing that most terrorists are mentally ill or suffer from some psychological disturbance (pp. 28-29). Most mainstream terrorism scholars have for some time moved on from these earlier theories which attributed much terrorism violence to psychological deviance, so this criticism comes across as a bit of a straw man. Nonetheless, there is an ongoing debate among terrorism scholars over the appropriate methodology to be used in terrorism research today, so this book’s fresh approach is worthwhile.4 The authors argue that no single theory can explain all the different types and varieties of terrorism, and they offer Social Identity Theory as an overall framework for analysis. Chapters 3 and 4 introduce Social Identity Theory (SIT), which involves attempting to understand how individuals—such as terrorists—are part of groups that are driven fundamentally by the same types of mechanisms, wants, and needs as other groups (p. 56). They note that analysts must be able to look at terrorist groups objectively, and even with empathy. This can be difficult, especially for law enforcement professionals whose job it is to arrest such individuals, not necessarily to understand them. In chapter 5 the authors argue that the principles of SIT can be used to analyze a wide variety of groups, including rightwing Christian fundamentalist groups, and not just the radical Islamist groups that receive most of the attention. 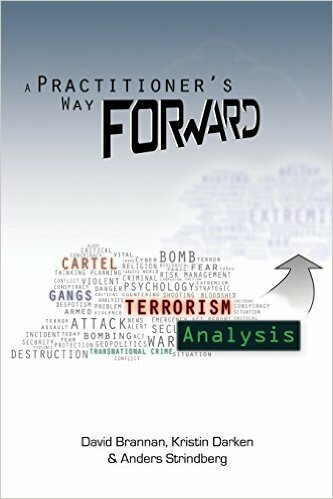 Chapter 6 provides practical examples of how SIT may be used to analyze a number of different articles and written works that a terrorism analyst might come across in his or her daily work. This section includes worthwhile examples and comments about the use of Twitter feeds and other social media information, but more material on the importance of social media for terrorism analysis today would have been useful. As a whole, these examples would be good in a college or graduate school course on critical thinking, but it might have been more useful here to present one or two case studies of real world terrorism groups or situations, rather than individual articles about such situations. Overall, this book appears to be more useful for undergraduates or graduate students studying terrorism or intelligence analysis than it is for its intended audience of homeland security professionals working in state and local intelligence fusion centers or other analytical positions.5 For example, it is not clear how often a local police officer would be asked to write an analysis of al Qaeda or ISIS, as the focus of this book implies. Although the authors do discuss the utility of their approach for examining bikers, street gangs, and other types of groups, more material on non-terrorist groups might be useful. The extensive use of graphics and cartoons is unusual to this reviewer, who is more used to reading dry scholarly works, but it may work in a book that is not intended for an academic audience. It is also not clear how appropriate the Social Identity Theory model is for understanding the growing problem that the United States and other countries are facing with home-grown and lone wolf terrorism. If a potential terrorist is not a part of a group, then how well do these principles, which are based largely on group identification, apply? It does appear that many or even most home-grown terrorists are inspired by terrorist groups, so these concepts may indeed be useful for understanding their motivation, but more discussion of this aspect of the problem would be useful. Despite these issues, this book can serve as a very good introduction to the art and science of intelligence analysis, especially for students or working professionals who are asked to conduct terrorism analysis. Erik J. Dahl is an Associate Professor of National Security Affairs at the Naval Postgraduate School in Monterey, California, where he teaches in both the National Security Affairs Department and the Center for Homeland Defense and Security. He is the author of Intelligence and Surprise Attack: Failure and Success from Pearl Harbor to 9/11 and Beyond (Georgetown University Press, 2013). The views in this review are those of the author and do not necessarily reflect the views of the Naval Postgraduate School or the United States Government. 1 For example, Sarah M. Beebe and Randolph H. Pherson, Cases in Intelligence Analysis: Structured Analytic Techniques in Action, 2nd ed. (Thousand Oaks, CA: CQ Press, 2015); Hank Prunckun, Scientific Methods of Inquiry for Intelligence Analysis, 2nd ed. (Lanham, MD: Rowman and Littlefield, 2015); Robert M. Clark, Intelligence Analysis: A Target-Centric Approach, 4th ed. (Thousand Oaks, CA: CQ Press, 2013). 2 James E. Steiner, Homeland Security Intelligence (Thousand Oaks, CA: CQ Press, 2015); Keith Gregory Logan, ed., Homeland Security and Intelligence (Santa Barbara, CA: Praeger, 2010). 4 For an example of the debate, see Anthony Biglan, “Where Terrorism Research Goes Wrong,” New York Times, March 6, 2015, at http://www.nytimes.com/2015/03/08/opinion/sunday/where-terrorism-research-went-wrong.html. 5 In fact, as the authors indicate, they have used many of these concepts in teaching master’s students in the Naval Postgraduate School’s Center for Homeland Defense and Security (CHDS). For disclosure: I also teach in that program and have worked with the authors at CHDS, although I did not assist with the writing of this book. Copyright © 2015 by the author(s). Homeland Security Affairs is an academic journal available free of charge to individuals and institutions. Because the purpose of this publication is the widest possible dissemination of knowledge, copies of this journal and the articles contained herein may be printed or downloaded and redistributed for personal, research or educational purposes free of charge and without permission. Any commercial use of Homeland Security Affairs or the articles published herein is expressly prohibited without the written consent of the copyright holder. The copyright of all articles published in Homeland Security Affairs rests with the author(s) of the article. Homeland Security Affairs is the online journal of the Naval Postgraduate School Center for Homeland Defense and Security (CHDS).